Ed Sheeran has told that he is "honoured" to help the London Irish Centre, having played a fundraising show at the iconic Camden building on Tuesday night. Sheeran, whose family roots are in Co Wexford, is both a patron and friend of the centre, with thousands donating £10 to enter a raffle to be in with a chance to win a ticket to see him perform at the centre's Camden base as only a limited number went on sale. "It's brilliant, not just 'pure Irish', but people from all sorts of different heritage and lineage to be proud of their roots and support places like this because it does such good work," the singer-songwriter told RTÉ's London Correspondent, Fiona Mitchell. "I'm honoured to be here today, and I'm glad it's raised a lot of money." 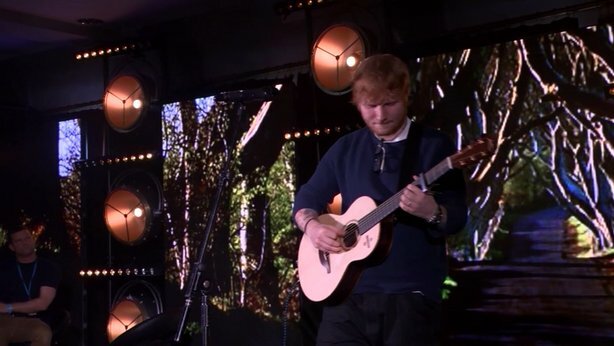 Ahead of the show, Sheeran was reunited with his old friend, fellow singer-songwriter Gary Dunne, who is the Director of Culture at the London Irish Centre - and someone who helped shape the direction of Sheeran's music.